I just noticed the U.S.News 2017 Best Colleges Rankings released. Increasing trend of tuition and fees is somewhat beyond my expectation. It costs $50,000/year or above in many national colleges on the ranking list. Even though the amount of fellowship/scholarship provided to undergraduate students has been increased, this level of tuition looks (at least to me) way too much. While the market equilibrium (an intersection of supply and demand) maximizes total surplus, the sum of the agents' gains from trades measured in monetary value, it inevitably generates the agents who are left-behind from any trades. Moreover, the number of such left-behind agents are maximized through the competitive market. The intuition behind the result can be illustrated by the following figure. In the figure, the number of successful trades or trade volume is 2. Consequently, 4 agents, 2 buyers and 2 sellers, are left-behind. As I explain in the paper, we can strictly increase the number of (mutually beneficial) trades if alternative buyer-seller matchings are possible. While such allocations reduce total surplus, equality is improved in the sense that more agents can enjoy surplus from trades and less agents become left-behind. That is, there exists a trade-off between efficiency (= total surplus) and equality (= trade volume). The above finding is not restricted to a specific example; I formally show that there exists a strictly more equal allocation than the competitive equilibrium under very weak assumptions. Therefore, we could essentially say that equilibrium allocations under competitive markets are most unequal (if Pareto efficiency and individual rationality are considered to be least requirements for any sensible allocation). This finding may suggest a potential limitation of market economy even if no market failure is presupposed. To check the further argument, please click here and download my paper! It is extremely short (the current version has only 8 pages), intuitive, and non-technical. In fact, it is by far the least technical among the papers that I have ever written, but I believe that its message and policy implication are the most significant. For example, consider a labor market. My finding implies that employment is minimized if the market works competitively. By contrast, some frictions or social mechanisms that prevent the market from being competitive may help to create additional job opportunities. This insight is consistent with the findings in experimental economics in its early literature: decentralized markets typically result in excess quantity. See my blog article "Chamberlin vs. Smith in Roth (1995)" for the detail. I am now trying to extend the model from a homogeneous good market to a general two-sided matching market with monetary transfers. New findings will soon be available! Amir, R., Ericksonz, P., and Jin, J. "On the microeconomic foundations of linear demand for differentiated products"
This paper provides theoretical foundations of the multi-variate linear demand function for differentiated products that is widely used in industrial organization. While quasi-linear preferences with quadratic utility function (for goods) is known to yield linear demand (Singh and Vives, 1984), the authors extend the result. Namely, under quasi-linear environment, they show that the resulting demand system becomes linear and well defined if and only if the underling utility function (for goods) must be strictly concave and quadratic. The "only if" part implies that the use of linear demand that does not satisfy the law of demand ought to be regarded with some suspicion. A theoretical punch line of the paper is that any (linear) demand system derived by consumer's utility maximization must satisfy the law of demand. I believe that we can establish a slightly more general result than this in the following way. It is known that (see, for example, Mas-Colell et.al. 1995) if a (Marshallian) demand function satisfies the weak axiom of revealed preferences and Walras' law , then its Hicksian demand satisfies the law of demand. If we further assume that there is no income effect, then the (Marshallian) demand function also satisfies the law of demand, since the two demand functions must have identical derivatives w.r.t. prices. The following is a summary the idea. The above argument does not presume any consumer's preferences or utility maximization behind the demand function. By contrast, the current paper associates consumer's demand with his/her utility function. Now, note that if a demand function is derived by utility maximization with an increasing utility function, then conditions (1) and (2) automatically hold. If utility function is quasi-linear and a consumer has enough income, then (3) is also guaranteed. Since these are exactly what the paper assumes, the sufficient conditions (1), (2), and (3) above are satisfied and thus the law of demand (for Marshallian demand) naturally follows. Mas-Colell, A., Whinston, M. D., & Green, J. R. (1995). Microeconomic theory. New York: Oxford university press. Singh, N., & Vives, X. (1984). Price and quantity competition in a differentiated duopoly. The RAND Journal of Economics, 546-554. I found very interesting description in The Handbook of Experimental Economics , Chapter 1: Introduction to Experimental Economics by Prof. Alvin Roth. He refers two pioneering papers on experimental economics, Chamberlin (1948) and Smith (1962), which investigate commodity markets under different trading rules and check whether competitive equilibrium could be established. 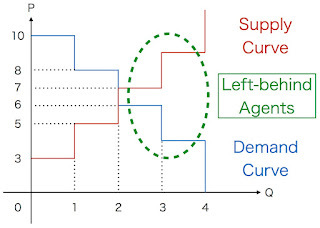 [T]he basic design of Chamberlin (1948) for inducing individual reservation prices and aggregate supply and demand curves has become one of the most widely used techniques in experimental economics. Interestingly, Chamberlin (1948) reports systematic gap between his experimental results and the competitive equilibrium. The experimental design and its results are summarized as follows. Chamberlin created an experimental market by informing each buyer and seller of his reservation price for a single unit of an indivisible commodity, and he reported the transactions that resulted when buyers and sellers were then free to negotiate with one another in a decentralized market. The experiment he reported involved 46 markets, with slightly varying equilibrium prices. He observed that the number of units transacted was greater than the competitive volume in 42 of these markets and equal to the competitive volume in the remaining 4 markets, while the average price was below the competitive price in 39 of these markets and higher in the rest. By contrast, (repeated) double auctions experimented by Smith (1962) result in convergence to the equilibrium. One important form of market organization is the double auction market, first experimentally studied by Smith (1962), who observed rapid convergence to competitive equilibrium when the market was repeated several times with stationary parameters. One might be puzzled why the number of transaction in ALL experiments in Chamberlin (1948) exceed or equal to the competitive volume: none falls below it. My recent article, Equal Market Design I: Competitive Market Achieves the Greatest Happiness of the Minimum Number, provides a theoretical account on this puzzle. This short paper (only 8 pages!) 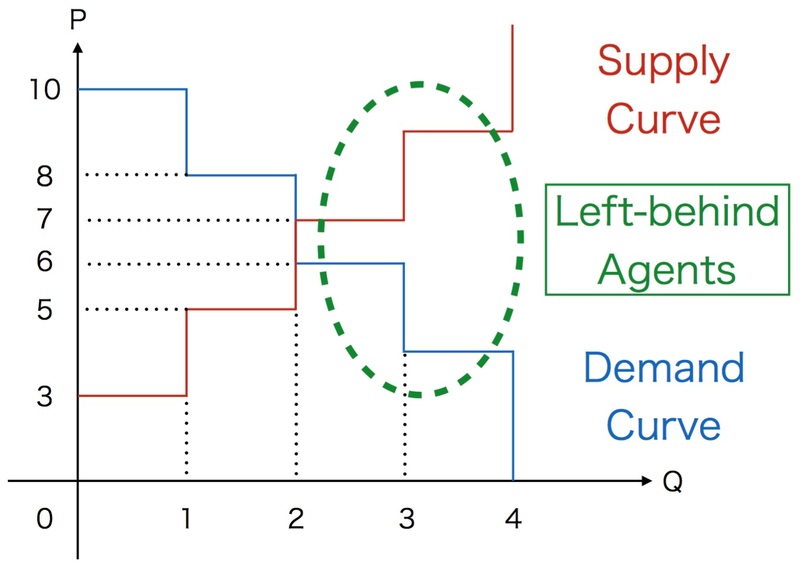 shows that the number of agents who engage in trades under any market equilibrium is MINIMUM among all Pareto efficient and individually rational allocations in the environment where redistribution by the third party is infeasible, i.e., no monetary transfers beyond buyer-seller pairs are prohibited. So, if buyers and sellers in Chamberlin's experiments somehow manage to reach the PE and IR allocations (it is likely although I have to check the original data if available), the number of transaction must be weakly larger than that of competitive equilibrium. I would like to thank Prof. Morimitsu Kurino who pointed out the possible connection between experimental studies and my research, explicitly mentioning the above two papers, i.e., Chamberlin (1948) and Smith (1962). Chamberlin, E. H. (1948). An experimental imperfect market. The Journal of Political Economy, 95-108. Kagel, J. H. and Roth, A. E. (1995). The handbook of experimental economics. Princeton, NJ: Princeton university press. Smith, V. L. (1962). An experimental study of competitive market behavior. The Journal of Political Economy, 111-137. I found a very interesting, entertaining, and informative movie. You can learn Japan's history just in 9 minutes! I have changed the title of this blog. Those who are familiar with economics books may guess where it comes from. I've uploaded lecture slides at SlideShare. They are written in English or Japanese. The below are the titles (+ links) of the slides that are written in English. It would be great if you could take a look! The following is a short version of An essay on Kandori and Matsushima (1998) "Private Observation, Communication and Collusion" (Econometrica, 66), the term paper of the class by Professor Dutta. The present paper analyzes the role of communication and the possibility of cooperation in a long term relationship, when the actions of the players are imperfectly observed and each player receives only private signal. The analysis of such a situation, a repeated game with (imperfect) private monitoring, is known to be a hard problem in game theory due to its fairly complex mathematical structure, particularly due to the lack of common information shared by players. Under private monitoring, the distribution of the private histories is no longer common knowledge after a deviation (off the equilibrium path), because only the deviator takes her deviation into account for up-dating her belief while other players cannot. This means the continuation play off the equilibrium path is not even an equilibrium of the original game. Therefore, the recursive structure found in the public monitoring case, i.e., the property that the continuation payoff after any history is chosen from the identical set of equilibrium payoffs, is destroyed under private monitoring (hence, we cannot apply dynamic programming techniques provided by Abreu, Pearce and Stacchetti (1990)). Indeed, in sharp contrast to the well-explored case of repeated games under public information (with the celebrated Folk Theorems by Fudenberg, Levine and Maskin (1994)), little had been known about the private monitoring case until recently. This is unfortunate because this class of games admits a wide range of applications such as collusion under secret price-cutting, exchange of goods with uncertain quality, and observation errors. In this paper, the authors introduce communication in the model with private monitoring to overcome the basic difficulty of this subject. Namely, they assume that at the end of each period players can communicate what they privately observed. The announced messages generate publicly observable history, and the players can play different equilibria depending on the history of communication. Facilitating communication as a coordination device, the authors construct equilibria in which players reveal their private information truthfully, and show that the folk theorem obtains under a set of mild assumptions. Finally, it should be noticed that their results provide a theoretical support for the conventional wisdom that communication plays an important role in sustaining collusion. To overcome the difficulties associated with private monitoring, the authors introduce communication which generates publicly observable history, and enables players to play different equilibria depending on the history of communication. Thanks to this communication, the recursive structure is recovered, and one can apply the results in previous literature, e.g., the characterization of equilibrium payoff sets provided by Abreu, Pearce and Stacchetti (1990) and Fudenberg and Levine (1994), or Folk Theorems given by Fudenberg, Levine and Maskin (1994). Folk theorem can obtain given Condition 1-3 listed below. If player j has a perfectly undetectable deviation at the minimax point for player i, j has no incentive to take it. If either player i or j (but not both) deviates with certain probabilities from a pure action profile wich generales an extremal point, the other players can statistically detect it. The players other than i and j can statistically discriminate player i's (possibly mixed) deviations from player j's at any pure action profile wich generales an extremal point. These conditions guarantee that every Pareto-efficient profile and each minimax strategy profile are enforceable, which is sufficient to establish the following Folk Theorem. Roughly speaking, Condition 2 and 3 correspond to the pair-wise identifiability condition and Condition 1 is replaced with the individually full-rank condition in Fudenberg, Levine and Maskin (1994). The former is sufficient for Nash-threat version of the Folk Theorem, while the latter, in addition to the former, is sufficient for minimax version of the Folk Theorem. Suppose that there are more than two players (n>2) and the information structure satisfies Condition 1-3. Also suppose that the dimension of V is equal to the number of players. Then, any interior point in the set of feasible and individually rational payoffs can be achieved as a sequential equilibrium average payoff profile of the repeated game with communication, if the discount factor is close enough to 1. In their communication model, one must induce each player to reveal her signal truthfully. To do so, they consider the equilibria in which each player's future payoff is independent of what she communicates. If this is the case, she is just indifferent as to what she says, and truthful revelation becomes a (weak) best response. Roughly speaking, efficiency under publicly observable signals can be achieved if players can be punished by "transfers". If the information structure allows us to tell which player is suspect, we can transfer the suspect player's future payoff to the other players. This can provide the right incentives without causing welfare loss, compared to the case where all players are punished simultaneously. The authors also examine the possibility of providing strict incentives to tell the truth. It is shown that when private signals are correlated, there is a way to check if each player is telling the truth and we can construct the equilibria in which the players have strict incentives for truth telling. If there are two players, or if the information structure fails to distinguish different players' deviations, the above idea cannot be utilized. However, even in such cases, the Folk Theorem can be obtained by infrequent communication. This is based on the idea of Abreu, Milgrom and Pearce (1991) that delaying the release of information helps to achieve efficiency. To analyze the equilibria, they employ the method developed by Fudenberg and Levine (1994). Instead of directly solving the repeated game, this method first considers simple contract problems associated with the stage game. Then, the solutions to those contract problems are utilized to construct the set of equilibrium payoffs of the repeated game. As I explained in Summary, the characterization of equilibria in repeated games with private monitoring have been an open question, because the games lack recursive structure and are hard to analyze. The present paper shows that communication is an important means to resolve possible confusion among players in the course of collusion during repeated play. Namely, as they introduce communication to generate publicly observable history, the authors recover the recursive structure and show a Folk Theorem. However, it should be noticed that they did not show the necessity of communication for a Folk Theorem. In principle, there is a possibility that a Folk Theorem holds even without communication. Indeed, the analyses of private monitoring have been rapidly developed (not yet achieve the complete characterization of equilibrium, though) since Kandori and Matushima (1998). Therefore, I would like to mention the recent literature on repeated games with private monitoring, which concludes this essay (I relied on the excellent survey by Kandori (2002) for the remain part). Sekiguchi (1997) is the first paper to construct an equilibrium which is apart from the repetition of the stage game equilibrium under private monitoring. He shows that efficiency can be approximately achieved (without communication) in the prisoner's dilemma model, if the information is almost perfect. Bhaskar and Obara (2002) extend Sekiguchi's construction to support any point Pareto dominating (d,d) (in the prisoner's dilemma), when monitoring is private but almost perfect. Sekiguchi-Bhaskar-Obara type of equilibrium is called "belief-based" equilibrium because they facilitate the coordinated punishment idea. Piccione (2002) and Ely and Valimaki (2002) introduce a completely different, useful technique to support essentially the same area under almost perfect monitoring. In contrast to "belief-based" equilibrium by S-B-O, their equilibrium utilizes the uncoordinated punishment idea, and hence is named "belief-free" equilibrium. Matsushima (2004) extends Ely and Valimaki's construction and show that their Folk Theorem continues to hold even if monitoring is far from perfect, as long as private signals are distributed independently. Ely, Horner and Olszewski (2005) give the most general results in two-player repeated games with private monitoring. Using "belief-free" strategies, they provide a simple and sharp characterization of equilibrium payoffs. While such strategies support a large set of payoffs, they are not rich enough to generate a Folk Theorem in most games besides the prisoner's dilemma, even when information is almost perfect. My new paper, "Exit Option Can Make Cooperation Easier" (joint with Takako Fujiwara-Greve) is uploaded at SSRN. The manuscript is very short (only 7 pages!). Please take a look if you are interested in how introducing exit option would affect cooperative incentives. I created a list of Japanese economists who currently work at universities outside of Japan: Link. As you might know, getting an academic job at a good research university is very difficult, even if you have a Ph.D. from a top school. The list shows that Japanese economists, especially among the young generation (those graduated their colleges in the late 90's or later), are highly competitive. In recent years, it is not uncommon for Japanese junior economists to get international academic jobs posted in the JOE. I wish my list help visualizing the great success of overseas Japanese economists, and stimulate domestic Japanese economists as well. By the way, a list of Japanese economists who work at domestic universities (with reasonably good research outputs) is now in preparation. Don't miss it!